Steel, Leather Lacing, Naturally-acquired Rust Patina, Hand-brushed Penetrol oil. Originally designed for the garden, my friendly sculptural figures have also wandered into the home to welcome visitors or hold open a door. 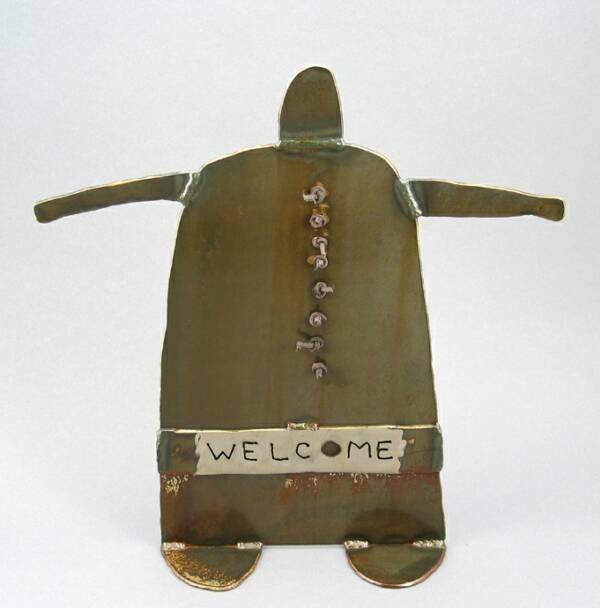 I regard these whimsical, full rounded figures as my 'Welcome Gnomes', and this one in particular is named BELLE. Artistically constructed from heavy steel plate and embellished with leather, BELLE is one of my most popular pieces. A fitting accent for the garden, home entrance, foyer, mantle, or used as a door stop, your fun-loving 'Welcome Gnome' will charm everyone! Every work of art is signed by me. I start out by hand-cutting individual pieces from heavy 1/8" steel plate using my plasma cutter. Then I grind the rough edges and assemble the pieces together using my tig welder. 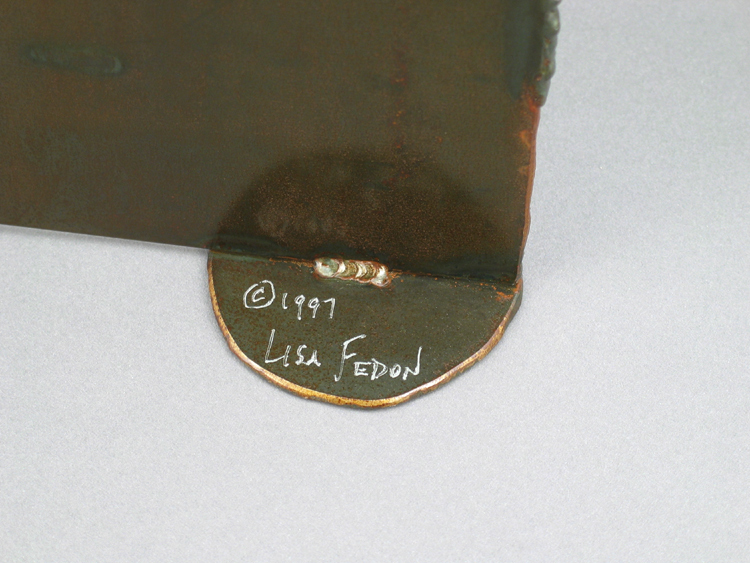 The fabricated piece is then cleaned with salt & vinegar to start the metal oxidation process, and then placed outside exposed to the elements to develop its unique, naturally-acquired rust patina. After several days of oxidation, I wash and clean the piece with water, let it dry, and then hand-brush two coats of Penetrol - a metal sealing oil that dries hard to a rich glossy finish. I then embellish the piece with leather lacing. Each piece has its own rust patina character so no two items will be exactly alike. If left outside exposed to the elements, this piece will age with time. If one desires, Penetrol oil can be applied once a year to maintain the lustre appearance. 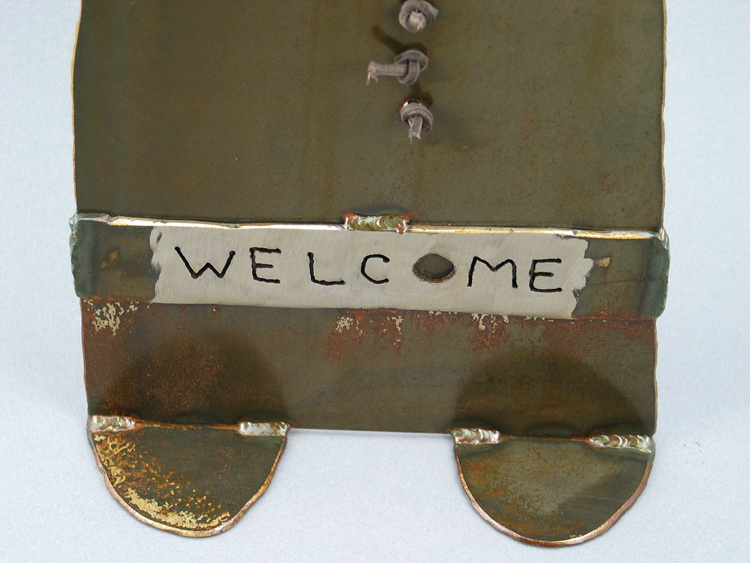 In place of the 'Welcome' message - Please ask me about personalizing this item - like your name, or a special message (1-2 lines only - limited space for lettering). This would be a special order request, but offered at no additional cost. Please allow 10 - 14 days for fabrication. Shipping cost as shown with this listing to continental U.S. addresses only. Contact the studio for shipping costs outside of the continental United States. Please review Store Policies for payment, shipping details, etc. Copyright © 2014 Lisa Fedon. All rights reserved.